This week, Wanderlust magazine reported the good news that India’s tiger population had grown by 20 per cent in the last four years. 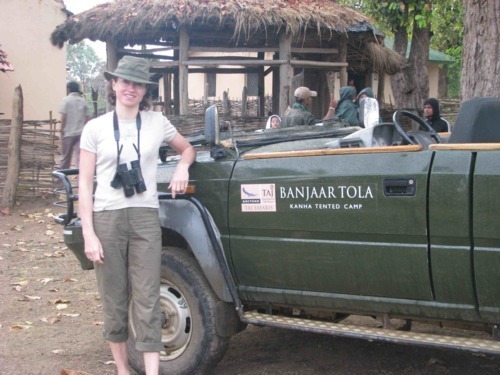 In the final guest blog by travel writer Laura Ivill, she shares the story of her recent tiger safari adventure in the national parks of Madyha Pradesh, India – staying at the exclusive Taj/&Beyond lodges; Bagh Van and Banjaar Tola. 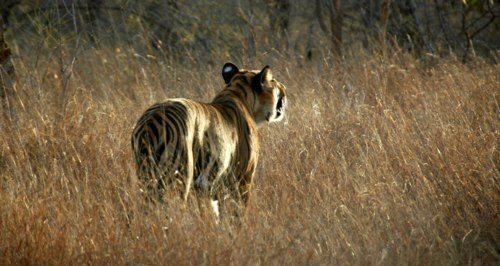 This is tiger country – where the great Bengal tigers roam in this protected area of dry deciduous teak forest. 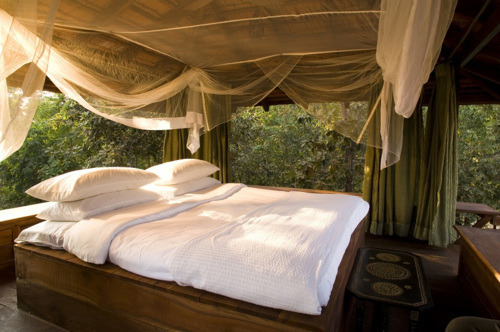 But the Bagh Van safari lodge is also a destination in itself. 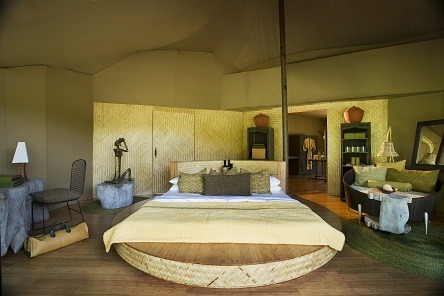 Luxurious in a stylishly rustic, low-key way, the 12 suites are each made up of two spacious bungalows linked by a walkway and stairs up to a covered day-bed that is also a nighttime sleeping platform, if you so wish. To have both an indoor and outdoor shower is something we dream of at home – as we dream of the hot, dry weather to go with it. 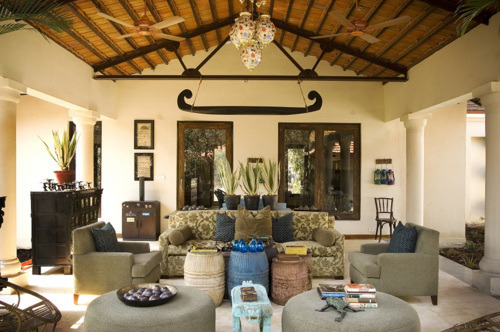 It was the creation of interior designer Chris Brown, and I had all the comforts I needed, including a copy of Rudyard Kipling’s The Jungle Book on my table, the story of a young orphan boy versus the powerful Bengal tiger Shere Khan, and set in the very forest that will by my home for the next two nights. Did I see a tiger? 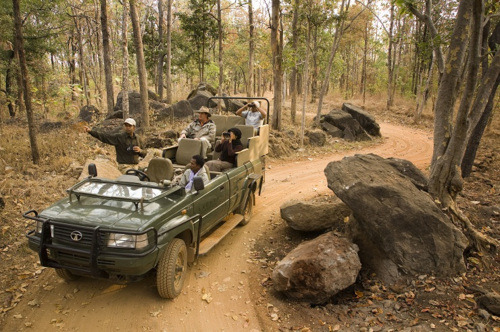 Not only one, but two – which was down to the knowledge and skill of our lodge’s Indian driver and naturalist, Yousef. The best times to see a tiger in the wild are at dawn, when the park opens at 6am, and again in the late afternoon and evening as the heat of the day cools down. These were the times of our two daily game drives – and in between there was plenty of time for a freshly prepared lunch, a swim in the pool, and a doze to the sounds of the forest. 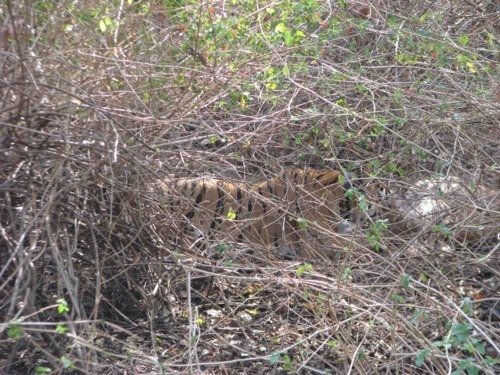 My second tiger was spotted at a distance that second evening in the undergrowth, but the first sighting that day had been a curious affair. Yousef was at the wheel early that morning, driving us around the park to see jackal pups, langur monkeys and their young, parakeets and sambar deer. But when no tigers were anywhere to be seen we stopped at a clearly to register our Toyota for the possibility of ‘tiger viewing on elephant back’. Unaware of what was ahead, I ate a light breakfast in the vehicle while the mahouts of the park rode out on their elephants to track the tigers in the bush – where the 4x4s weren’t permitted to go. 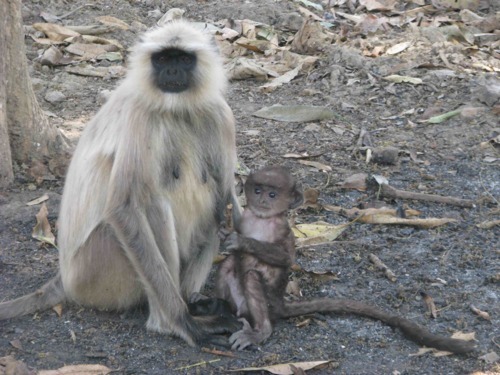 We soon had word that the mahouts were in luck. 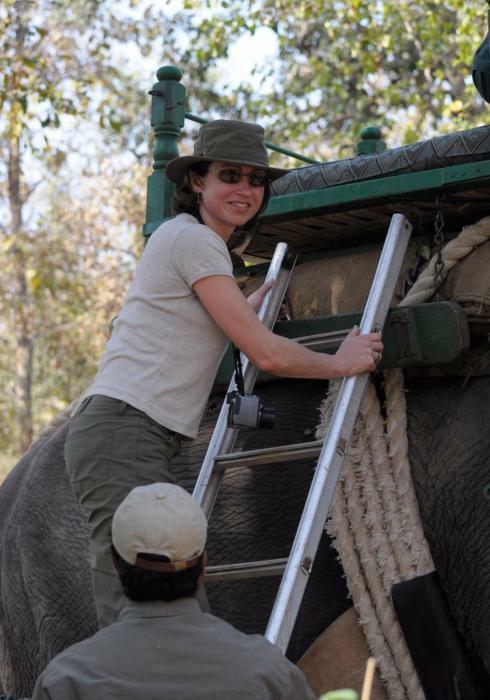 My companion and I clamboured up onto the howdah and the mahout encouraged and directed our elephant through clawing, dry lanterna bushes towards a well-known female. The tigress was feeding on her breakfast, too – not the soft rolls and curry sauce I’d been having – but she had hunted and killed a substantial sambar deer, prey that she would be feeding to her five cubs tucked away out of sight once we had snapped like mad with our cameras and departed. A four-hour drive across rural India from Pench National Park, I arrived fresh and inquisative about my new camp for the next two nights. How can you follow the charm of Baghvan? 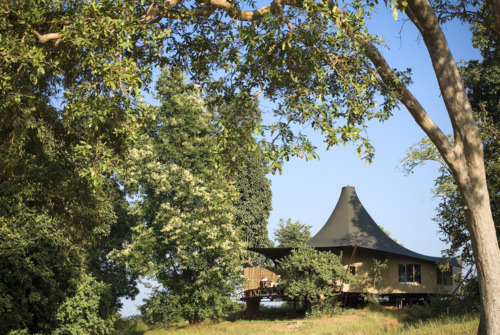 Banjaar Tola is actually two separate tented camps of just nine suites each – and there is so much space to relax in it feels luxurious from the moment I arrived. My bathroom alone was the size of a small apartment, and my butler was attentive and thoughtful – drawing me a bath on my return from each evening’s game drive, scattering the water with petals and opening a bottle of wine for me to enjoy. This time, Sarjith was at the wheel of our Toyota, and his enthusiasm for the variety of wildlife the park had to offer was infectious. 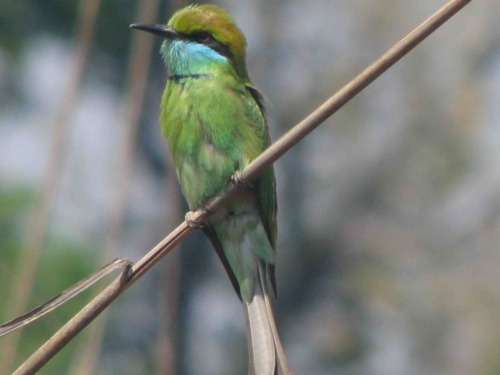 No tigers this time – bursts of warm rain kept them hiding – but we three guests in the vehicle saw herds of grazing bison called gaur, peacocks – the national bird of India – displaying their extraordinary plumage, sculptural termite mounds wherever we looked, and green bee-eater birds. In the evenings guests dined by candlelight – miriad lanterns flickering in the darkness of the forest, lighting our way to the tables where we were sevrved local Indian cuisine cooked with flair. At night, after our beds were calling us, the lights were extinguised to return the woodland to the animals to which it truly belongs. 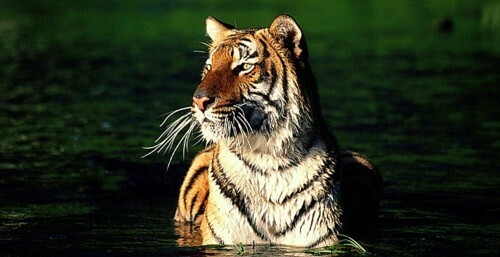 Click here more information on our Tiger Safari itineraries in India or call our India travel specialists on 020 8682 5075.